If you are looking for a fun-filled place for your kids and children, consider the Escape Theme Park Singapore located at Downtown East in Pasir Ris, Singapore. This Theme Park Singapore may not be as glitzy as the theme park at Sentosa (also known as Universal Studios Singapore). 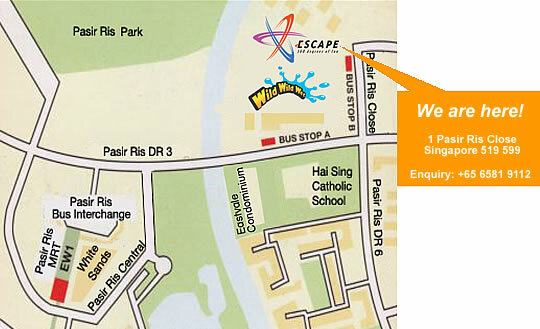 However the Escape Theme Park was here in Singapore way before Resorts World landed on Singapore shores. Tucked away in the idyllic north-east corner of Singapore Escape Theme Park Singapore has rides and features that are high on the fun quotient, for kids and the young at heart. Open on Sat, Sun and Gazetted School & Public Holidays.